Attention all Huarache heads. 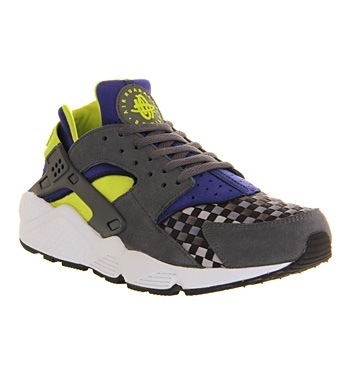 Today we have another drop of the never ending Huarache colourways. The newest addition to 2014 is available in a dark grey, blue and venom green colourway. This trainer also features a brand new woven toe box. Acronym are a German based technical outwear brand founded and modelled by Errolson Hugh. Initially founded by Michaela Sachenbacher & Errolson Hugh as an independent design agency with a focus of uniting style and technology in apparel and continue to amaze us with their inventions till this day. Known for their techinical and functionality details on their garments. Acronym last amazed us with their SS13 collection video and with their huge attention to detail, making it ideal for the man always on the move. Acronym have a unique and modern day feel which is a result of their choice using waterproof and windproof fabrics such as Gor-tex, Schoeller and amphibious cotton. Their sharp and often minimalist appearance means that their jackets can be used in a both formal and social settings. One thing that makes Acronym and designer Errolson Hugh really stand out is their innovative approach to function of their garments. Most technical outerwear seem to only cover the basics and often are only concerned with protection from the elements making garments waterproof windproof breathable insulated etc. Weather in the UK is so unpredictable and we’ve all been in that situation where we think “better bring my jacket, you never know” only to be stuck with your jacket wrapped across your soon to be sweaty arm whilst holding your bottled mountain water and balancing a Cornetto! Well team Acronym thought of that and introduced a ridiculously simple idea of integrating a jacket sling into their outer. The buck don’t stop there, they also created a new style of jacket pocket called the GravityPocket, a pocket within the sleeves where a slight “THRUST” of your arm allows the contents in this pocket to be placed in your hands (we don’t recommend using this pocket whilst out raving!). Accessories such as their 3rd-arm line of bags and straps will have you speechless as to its ability to morph and adapt to the users needs (with further add ons) and its compatibility with some of the outer pieces. Their SOUND FORCELOCK a Magnetic collar for headphones still blows me away! Paying attention to detail like that, is just what we style heads love! Its no wonder that Carlo Rivetti of Stone Island took on Errolson Hugh to design the Stone Island Shadow Project line of clothing. With such an innovative and functional approach to technical apparel we believe that Acronym will be a solid brand and still be with us in years to come. This video of their new SS14 collection, continues to show off their crazy futuristic and creative concept It also continues in their tradition that is now being noticed not only with their core followers, but with style enthusiast everywhere including GUCCI (tssk tssk). Collection is now available from the official ACRONYM online store. Nike are known for collaborating with the creme de la creme and this week is no exception. 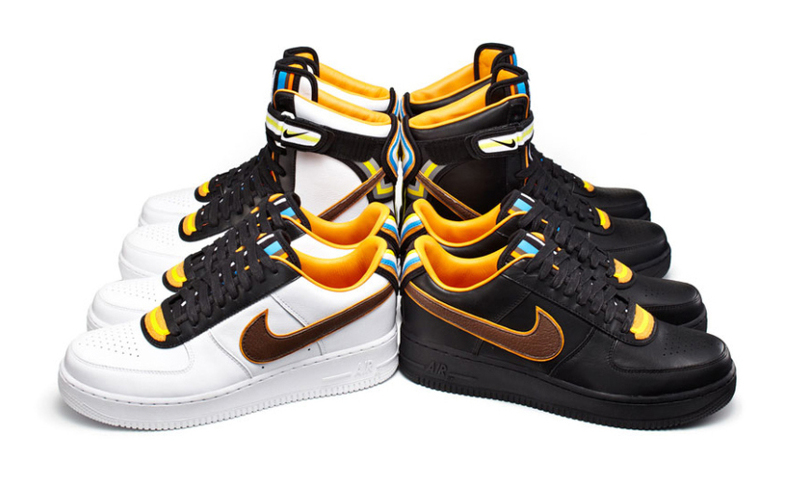 Riccardo Tisci, designer with French fashion house Givenchy has reinvented Nike’s iconic silhouette the Air Force 1 for Spring/Summer 2014. 27 years ago. The date, 26 March 1987. The day a revolution began. This was in the form of a window to the sole, the invisible finally became visible and Nike Air cushioning changed the way in which Nike designed running sneakers. In the years following the release of the Air Max 1 all those years ago a legend has just gotten bigger and we can celebrate the day an experiment turned into an iconic trainer for Nike. To start the celebration we will see the release of a limited edition Air Max 1. Maharishi follow up their strong Fall Winter 2013 collection with a preview of the Spring/Summer 2014 collection in the same way. The collection, according to the brand, continues to explore the culture of the “Pacifist Prepper” this season, with a focus on the Lunar Effect. Billionaire Boys Club shot a dope video lookbook for their Spring/Summer 2014 collection. In celebration of the college basketball season the Jordan Brand has put together a special ‘Rivalry Pack’ in the colourways of two of their sponsored teams, UNC (University of North Carolina) and Georgetown. These limited edition Air Jordan 1 Retro KO High’s comes to those of you in the US as a double boxed pack. Prices circulating the internet so far show them to be in the region of $300. I believe UK stockists are offering them separately. Its like a total Air Jordan overload with the releases that we are seeing at the moment. This is the Nike Air Jordan 1 Retro High “Chicago”. The Jordan Brand revives this silhouette in retro form with the “Chicago” as the first to be released. This shoe comes with a canvas upper with AJKO wings logos to the sides. Jordan brand has done it again and bring us a new shoe to the Jordan range. Jordan continue the relationship and pay tribute with off-court/non-basketball shoe designs. There’s been quite a buzz around these on the sneaker blogs and networks and judging by people’s comments, it’s another love/hate thing. 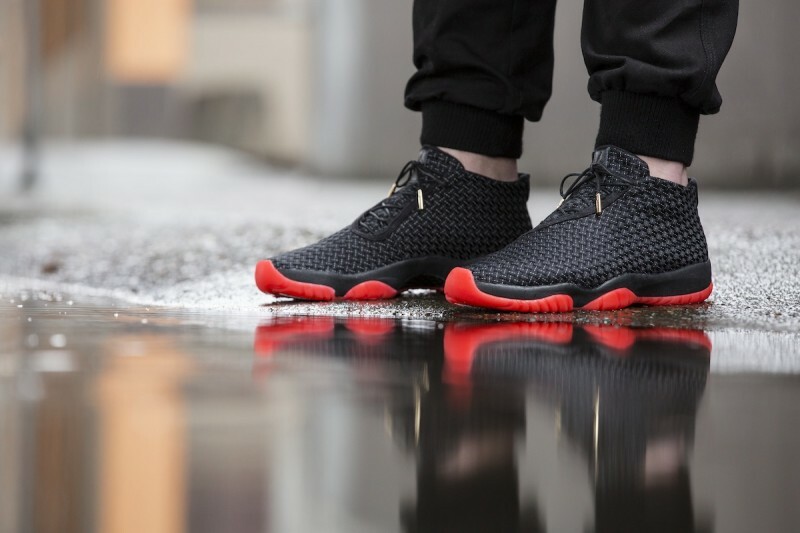 But thats exactly what Jordan want as they continue with the evolution of the Jordan Brand’s off court range. Images are now surfacing regarding the next Jordan to drop in the “LAB” Series. 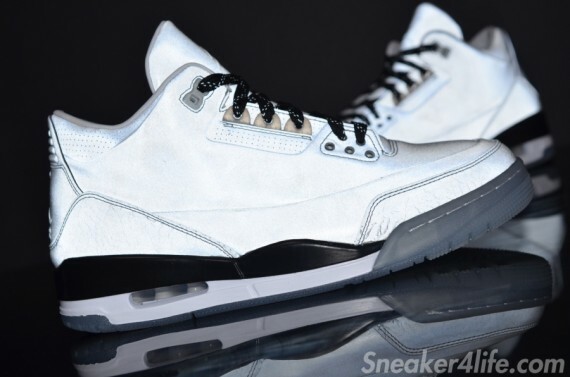 We saw two recent 3Lab5’s drop towards the end of 2013. This time they’re taking the Jordan 3 and giving it the full 3M treatment. We’re accustomed to seeing the iconic 3M on the tongues of multiple Jordan 5s but this time they’ve applied it to the entire upper of the Jordan 3 which is no doubt a first for the Jordan 3 silhouette.